In the heart of the Era, the villa overlooking the hill the beautiful Tuscan countryside, is part of a small family-run farm. From the terraces of the villa we can admire the olive trees of the property. The decor is modern and Tuscan-style mixed, maintains the charm of the place, combined with care and elegance of the furnishings. Spaces available to guests: a large entrance hall, a large living room with fireplace and library, a large kitchen equipped Tuscan style. 6/7 bedrooms, 4 bathrooms. It has convenient accesses the outside, a large covered terrace and balconies, large garden. The swimming pool (size 12 x 6 m, 1:50 h) equipped, offers guests umbrellas, a gazebo and sun beds. And 'it fenced and is located in the most scenic area of ​​the property. Other garden equipment are: barbecue, wood-burning pizza oven, gazebo, table tennis. Free private parking within the property. It features 3 baby beds, 2 high chairs. I am an architect, a few years I take care of the reception of the guests in the property in the countryside. I love the family, the animals, the scenery, reading, traveling, cooking, being with friends perhaps enjoy a good glass of wine. The property, built and developed by my father, lives with my management thanks to the guests. In this fantastic panoramic position we have olive trees and produce oil. The POOL is the most panoramic location of the property. The villa is ideal for larger families or groups, comfortable with sleeping spaces divided from living areas. To smarten big groups you can rent the "medlar" apartment next door. Perfect location, garden, pool and view. Me and my friends really enjoyed staying in Silvias house. The house was perfect: the location, the garden, the pool and the view. Easy to get around, with car we could visit Pisa, Florens, the beach and the nearby old cities (Volterra for example). Also nice to get around by foot: the hiking/walking tour to Montecastello is cosy and the local restaurant ”Three frogs” in Treggiaia (5 minutes Walk away) is well worth a visit. We also appreciated the luxury of being 9 persons and still having our own ”private spaces” (since the rooms are located in 3 different levels in the house, and also thanks to the many bathrooms). Silvia is a great host - warm, helpful and easy to reach. 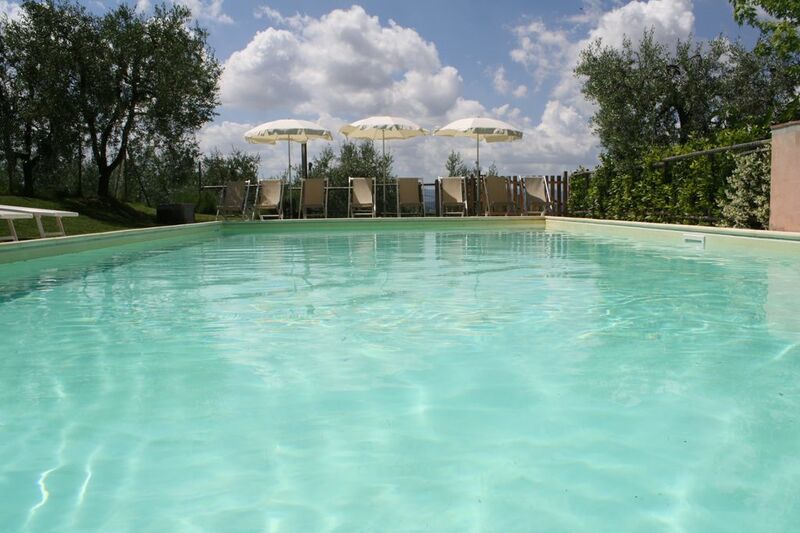 We warmly recommend everyone that are seeking to enjoy Tuscany to stay at Silvias place! Beautiful view, lot of space inside and outside, nice trips in the surroundings (Pisa, Firenze, shore, vineyards...), Silvia was very helpful. First week a lot of mosquitos, then after a measures been taken it was perfect. "We were two families together (Norway), renting the villa for a week. It was spacious, clean and had a fantastic view! We just let the kids have the upper floor with two spacious rooms with 5 beds, and there is 3 bedrooms on the first floor with double beds. The property is also spacious, with a really nice big pool. Kids and adults loved it! Silvia is also producing her own olive oil that is absolutely marvelous. Treggiaia is close to Pisa and Lucca and one hour from Florence. We will highly recommend this to others." "The house was an excellent place to stay for a big family. Spacious rooms, beautifully decorated, cosy, felt like home, wonderful views from the terrace. The pool was big and the owner had kindly provided also a plastic pool for small children. The owner was very friendly and easy to approach.We can definitely recommend this house." Sehr schönes Haus mit einem noch besseren Pool! Wir waren 14 Leute und hatten einen wunderschönen Urlaub. Das Haus, das Grundstück, der Pool und nicht zu vergessen die Lage. Alles ist perfekt. Keine Probleme das Auto abzustellen. Viel Platz in der Küche, Wohnzimmer und Terrasse. Und bei einem 12x6m Salzwasserpool mit einer Solardusche mit Blick in ein Tal war die Welt in Ordnung. Ein kleines Manko gibt es trotzdem. In dem Haus gibt es eine Klimaanlage. Jedoch nur für einen Raum direkt unter dem Dach. Alle anderen Schlafräume sind nicht klimatisiert. TARIFFA RIDOTTA PER VILLA 14 PERSONE MAX TAX STAY= 1,00/P/DAY i primi 5 giorni, escluso i bambini <10 anni. PAGARE al ceck-out in contanti.